Guinea fowl seem to originate from ancient Numidia (now Algeria). They were probably called “Pharaoh”, faraone in Italian, because they were an animal that was very popular with the Egyptian kings who lived close to the border of Algeria. In fact, guinea fowl are a very regal poultry with their plumage (gray small dots, the variety known to me) and for the elegant way they walk. 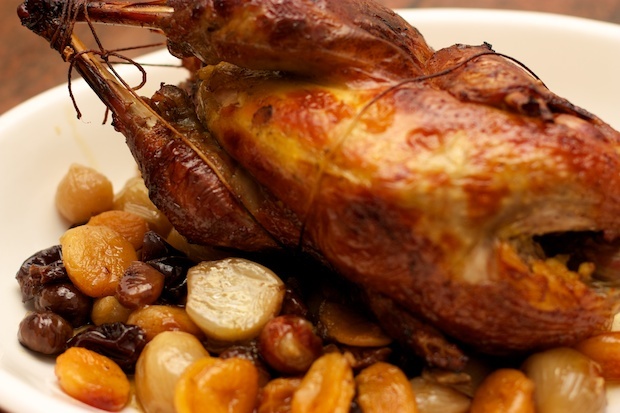 We raised ten guinea fowls each year in my family, which were eaten on special occasions. My aunt Regina (Gina) believed that nothing was more refined meat of this chicken. To me they seemed like strange birds and I did not understand the importance that was given to them in their family. With my aunt is gone, the tradition of raising faraone has also died. Once a year, we can still enjoy this meat with my uncle Antonio (Toni) that kept raising faraone. The ideal time to consume this meat is from December to January when the animals that are bred naturally reach full ripeness. 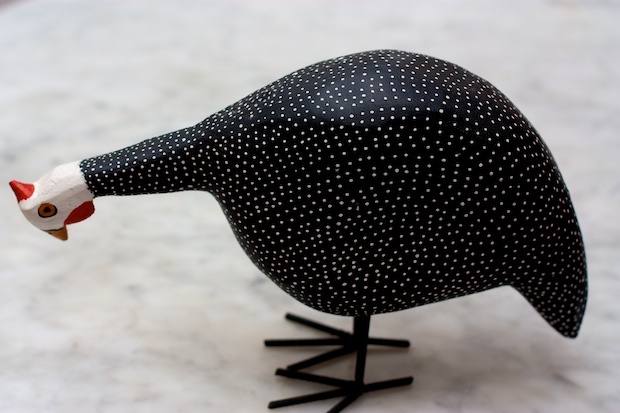 Some years ago during a trip to Denmark in a small workshop of a wood sculptor we found a guinea fowl that had been placed in a corner because it had the enamel, simulating the plumage, slightly damaged. My husband immediately liked it and I thought it was a nice memento to have at home. Even if it was made of wood, it still was a cue to remember Aunt Gina. Returning home we showed the bird to our architect friend, Poalo, who loved it and offered to restore it. So now I have this bird sitting in my living room above my cabinet of good china as a constant memory of good and beautiful things of life. This recipe is suitable for lunch or an important dinner. If you have a wood stove use it and you will have the same result I had when I cooked the bird. Season the guinea fowl with salt and pepper. Place it in a oval casserole with the oil, garlic, and herbs that have been gathered in bundles and tied with cooking twine. Preheat oven to 375-380 F.
Insert the guinea fowl and covered sauté pan over high heat for about 15 minutes turning it over at least twice. Pour in the wine and let it evaporate. Wash the apricots and plums. Place the shallots in a pan and dried fruit. Pour a cup of boiling broth. Cover the guinea fowl with a foil and then put in the oven. Turn every half hour. Keep it covered at first with the foil. After this time, remove the foil and continue baking for 30 minutes. To check the cooking guinea fowl with a fork prick the thigh. If it enters easily it is cooked, otherwise cover it to prevent it from drying out and continue cooking for another 30 minutes. (If you use a wood-fired oven cooking can take up to 3 hours). Serve on a large platter with fruit on the side. If you can, cut it at the table, otherwise you can cut it in the kitchen on a cutting board. Keep the fruit and juice warm. Posted in Meat, Recipes. RSS 2.0 feed.